This outstanding example of a 2015 Mercedes-Benz G 63 AMG **WAS ANTONIO BROWN'S PERSONAL CAR!! ** is offered by Dallas Autos Direct. How to protect your purchase? CARFAX BuyBack Guarantee got you covered. 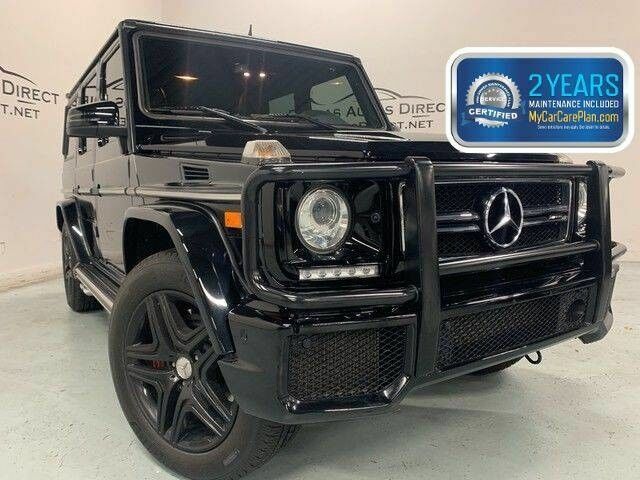 The CARFAX report for this 2015 Mercedes-Benz G 63 AMG **WAS ANTONIO BROWN'S PERSONAL CAR!! ** highlights that it's a One-Owner vehicle, and for good reason. A One-Owner vehicle gives you the feel of owning a new vehicle without paying the new car price. The Mercedes-Benz G 63 AMG **WAS ANTONIO BROWN'S PERSONAL CAR!! ** offers a fair amount of utility thanks to its advanced features and unique styling. It's also quite sporty, and injects an ample amount of handling chutzpah into the ridin'-high body of a family-friendly SUV. There's a level of quality and refinement in this Mercedes-Benz G 63 AMG that you won't find in your average vehicle. When the Mercedes-Benz G 63 AMG **WAS ANTONIO BROWN'S PERSONAL CAR!! ** was created, it was automatically enhanced by having the performance ability of all wheel drive. Not only will you notice improved steering and superior acceleration, but you can also rest easy knowing that your vehicle comes standard with increased stability and safety. It's not a misprint. And the odometer isn't broken. This is a very low mileage Mercedes-Benz G 63 AMG. A rare find these days. Added comfort with contemporary style is the leather interior to heighten the quality and craftsmanship for the Mercedes-Benz G 63 AMG Put away your phone and focus on the road, your new vehicle has navigation. One look is all it takes to know what a find this 2015 Mercedes-Benz G 63 AMG **WAS ANTONIO BROWN'S PERSONAL CAR!! ** is. New tires are just one more reason this vehicle is a great deal. In addition to unbelievable options, this vehicle comes equipped with a factory warranty. They say beauty is on the inside and once you experience the unbelievable options in this Mercedes-Benz G 63 AMG, you'll agree that this is one beautiful vehicle. Speed is a game changer and this awesome machine is so fast it didn't just change the game, it rewrote all of the rules. This gently driven vehicle has been well-kept and still has the showroom shine. All records are included with the purchase of this well-maintained pre-owned vehicle. Upgraded wheels enhance the look of this Mercedes-Benz G 63 AMG. More information about the 2015 Mercedes-Benz G 63 AMG: The Mercedes-Benz G-Class--otherwise known as the "Gelandewagen" (off-road vehicle) in German, is unique in the market. It features an old-school truck body-on-frame chassis and military credibility. Mercedes-Benz has given the G-Class extraordinary toughness for the trail, surprising comfort for freeway driving and luxury enough to hold its own at the country club. The G-Class starts at $115,400, but the G-Class's unique packaging and outstanding off-road credibility means there's no competition in this segment. Interesting features of this model are modern communication and entertainment features, plush luxury interior, serious off-road hardware, and Tough, boxy look Finance available with applicable fees.